With Mom going back to school, I forgot to post the kids' first day. Here's Hyrum. Favorite Song: "Bye Bye Bye"
I never got a picture of the boys with their summer "no haircut" look. They made me promise no haircuts till school started, and these pictures below were taken with almost a month of summer left. Hyrum got so shaggy and bleached that when he swam, it stuck up all over his head. I almost forgot to take pictures while we were shopping, but I did remember when he chose where to eat lunch--Target. 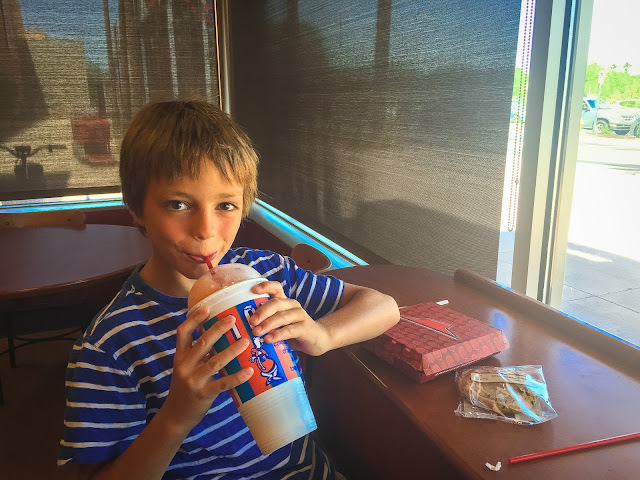 I don't know why he loves eating there so much, but one reason may be that he can create his own original Icee mix. 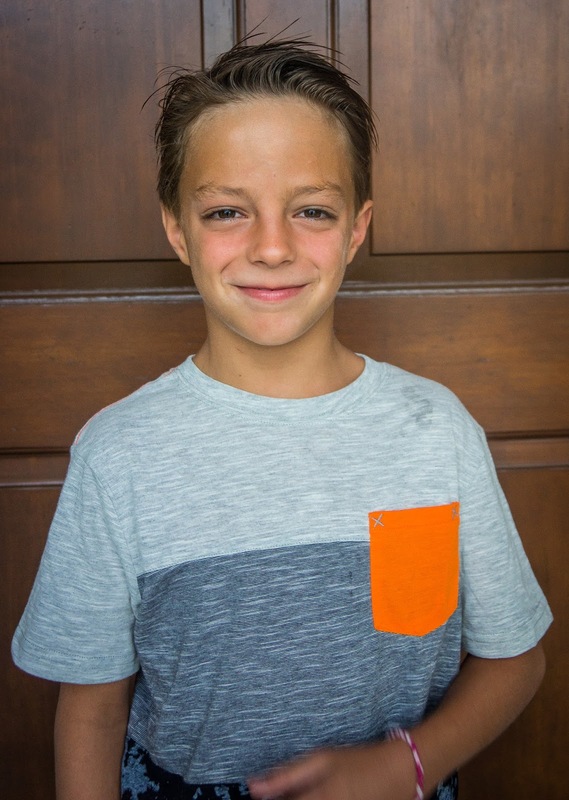 Hyrum didn't need much for school this year--mostly underwear, socks, and shoes. The Adidas he picked out at the beginning of last school year lasted the entire year (they were barely holding together by the end of the year, and you could see light through them, but he wore them proudly every day), so he was convinced he needed Adidas again this year. If they lasted like that, then I was happy to oblige. Fourth grade--different recess schedules, Arizona History, and now he's the oldest Denton at the school this year. Lots of responsibilities for this kid, and he's ready for it. This boy and his warm chocolate eyes--he melts me all the time. I can't wait to see what this year brings him. 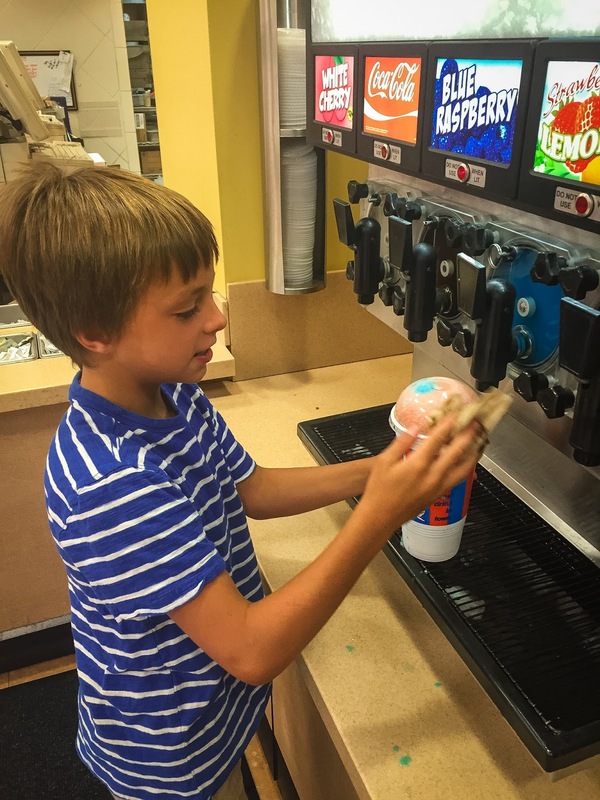 Yep, I bet it's the Icee. Cute guy! 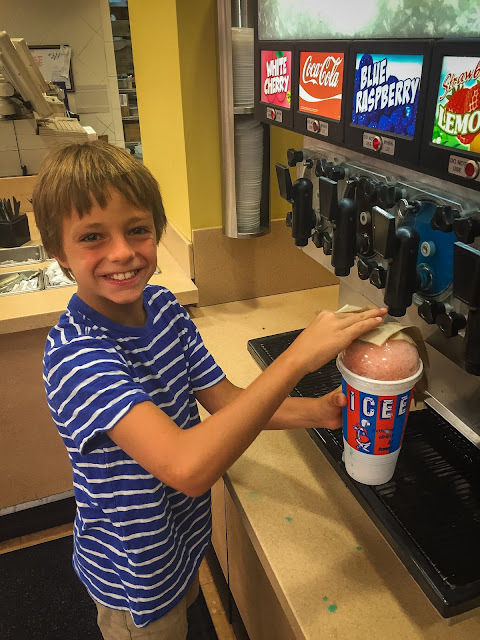 Hyrum looks pretty happy at the Icee machine...I feel the same way on the inside when I treat myself to one of those! He looks so much younger with his shaggy summer hair! I hope his 4th grade year is a fantastic one!